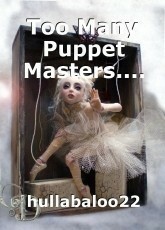 More than one puppet master can lead to serious puppet damage. Until my world, it spins. My free will you will smother. It doesn't get a glance. And put me on the shelf. And singing my own song. Just try not to lose yourself! Well, I'll try not to, Mike. WHY THE HECK WOULD YOU DO THAT?!?! ?